Description: McMillan elevator was destoyed by fire. 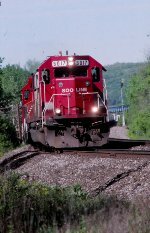 Title: Soo 6039 on CSX grain train on ex-Gadsden line. Description: Train 422 heads up the new siding at CP 286. Description: CP 261 with 90 trailer flats behind SOO power rolls past the Erie semaphore at Barton. This one was easy to get to, as it was right next to the road. 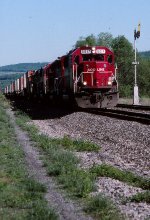 Description: 261 rolls toward the NY 352 overpass in Big Flats in a scene that allows a view of the whole train. Description: The 261 train rolls out of the north end as it starts its trip to Chicago. Ill chase this guy to Hornell. Description: 261 rolls west past CP Adrian and into the curve at Browns Crossing. Description: 261 rolls along the Canisteo River on one of the most scenic parts of the Tier. Description: 261 rolls along the Susquehanna between Campville and Owego. Description: This was the easternmost semaphore on the Tier, and would be the last one to go in 2004. Train 261 rolls past behind typical SOO power. Description: 167 rolls west past the old EJ plant in Johnson City. Description: I knew if I went far enough the sun would come out. Here it is as 167 rolls past the site of OG tower, where the Erie crossed the DLW Ithaca Branch, and passing the Erie station. Description: 167 starting through the north end crossovers as it makes its way to the Tier. Chased him out to Owego. Description: The shot at the stone arch brodge over NY 7 is a good one, though by 2001 it had become mostly treed in, though a winter shot was still workable. Description: 252 arriives at Bignhamton behind a pair of SOO SD60s and CP ancient warriors. 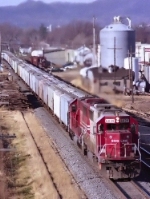 Description: CP 166 rolls 99 cars past the signal at Tioga Center. Not nearly as much fun since the semaphores were taken down. A decade later, these units would become rebuild fodder. Description: NS H1G, a Binghamton based local, has the James E Strates circus train in hand, passing a waiting 30T at the south end of Bevier St, with the unlikely combination of an NS wide cab and a SOO SD60. Description: Im not normally one to shoot 3/4 wedge shots, but sometimes you have to take what you get. Here we see red barn 9017 leading 38T at Depot Rd in Campville. Description: A cloudy day is sometimes the most productive time to shoot this location, sandwiched between industrial buildings at the east end of Muskego Yard. The building behind Soo 6039 is now condominiums. No whistles are blown at this crossing. Description: SOO 6039, SOO 1543 and SOO 6026 make for an interesting trio as they usher train 484 down the CP River Sub and into a nice patch of sun, which has just recently broken through the stubborn clouds seen in the background. Description: Taken from the 27th Street Viaduct. This was before the Hustle Muscle engine was Repainted at the WSOR Shops.